What do you do when your sugars go high? Hyperglycaemia, when blood glucose levels rise too high, happens to many people living with Type 1 diabetes. 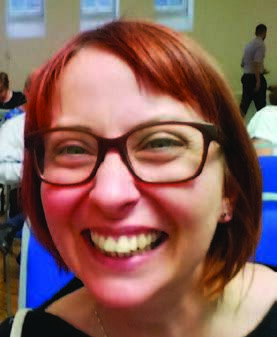 Penelope Hamilton-Evans, diabetes specialist nurse, Diabetes Care For You at Sussex Community NHS Foundation Trust offers advice. For those on insulin occasional mild episodes can be managed using correction doses and may remedy themselves, but hyperglycaemia, often called a hyper, can lead to complications over time. If you are on oral medication and levels stay high, you may need a medication review. "You need to look at the whole picture,” said Penelope, adding that typical symptoms included feeling thirsty, passing a lot of urine, blurred vision or feeling tired." "If you are on insulin, think about your previous dose, your meal (carbohydrate ratio) and any activity or exercise, and if injecting insulin, are your injection sites free from lumps as this can affect absorption." "A correction dose of rapid insulin can help bring glucose levels within target range. Your diabetes team can help you work out your carbohydrate ratio and correction doses. If your levels remain elevated despite correction doses, please seek advice from your diabetes team," she said. She recommended following the Sick Day Rules (see inset) to self-manage a hyper, if hyperglycaemic and unwell. It is important to check for ketones, and not to ignore any symptoms of diabetic ketoacidosis (DKA). "If you are nauseated and can’t keep food and fluids down, or have abdominal pain, or shortness of breath, these are signs of DKA and you need to seek urgent medical attention," said Penelope. Very high blood glucose levels, or levels that stay high for long periods, can lead to DKA. It happens when the body starts breaking down fat as an energy source, and, in the worst cases, can result in diabetic coma. Symptoms include needing to urinate more than usual, feeling very thirsty, fruity smelling breath and confusion. 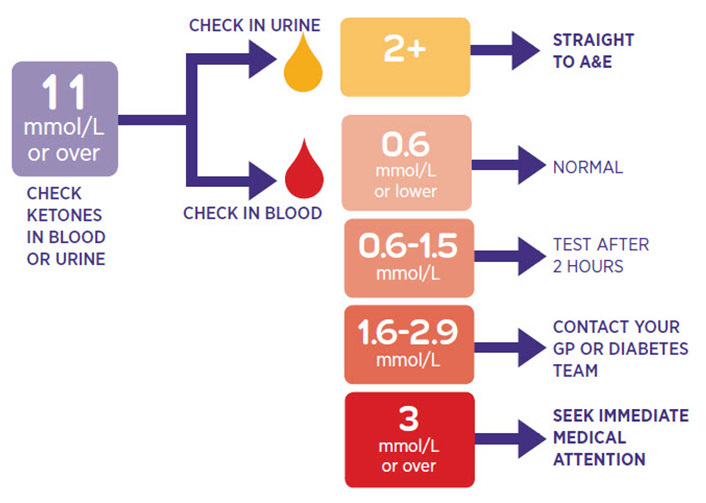 NHS Choices recommends checking ketones, either in the blood or urine, if your blood glucose is 11 mmol/L or over. If testing in urine, any reading of more than 2+ means you should head straight to A&E. In a blood ketone test, anything lower that 0.6 mmol/L is normal, and 0.6 – 1.5 mmol/L means you should test again after a couple of hours. If your result reads between 1.6 and 2.9 mmol/L, contact your GP or diabetes team, but anyone with a reading of 3 mmol/L or over should seek immediate medical attention. What are the sick day rules?